Mahmud is a loving husband, doting father and an admittedly “relaxed” Muslim: a normal guy living an everyday life. That is until a chance discovery turns his life upside down, throwing him into a full-scale identity crisis: it turns out he’s adopted, and was actually born Jewish. The film will be introduced by Jane Murphy, Assistant Professor of History. 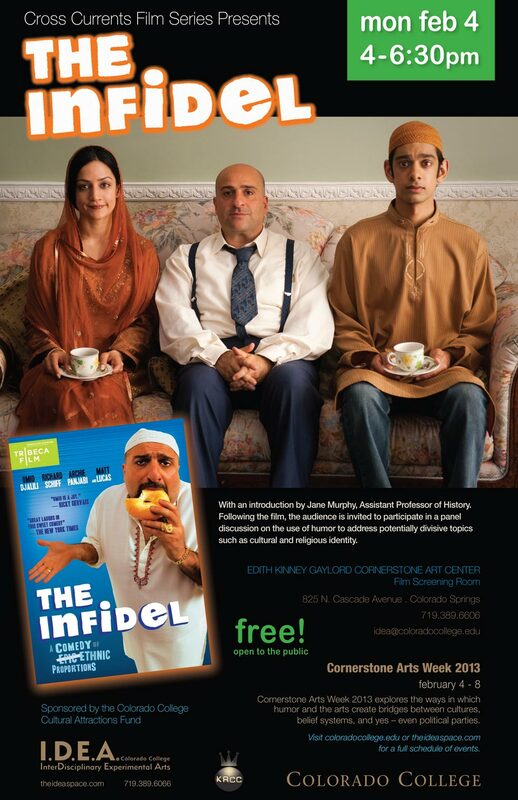 Following the film, the audience is invited to participate in a panel discussion on the use of humor to address potentially divisive topics such as cultural and religious identities. Sponsored by the Cultural Attractions Fund. 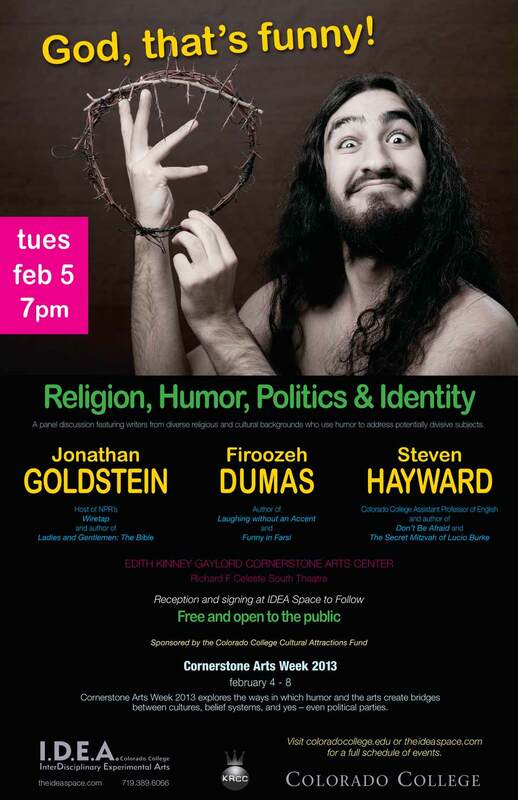 This panel discussion features three hilarious writers from diverse religious and cultural backgrounds who use humor to address potentially divisive subjects. Firoozeh Dumas, author of Laughing without an Accent and Funny in Farsi; Jonathan Goldstein, host of public radio’s Wiretap, This American Life alum, and author of Ladies and Gentlemen: The Bible; and Steven Hayward, Colorado College Assistant Professor of English and author of Don’t Be Afraid and TheSecret Mitzvah of Lucio Burke. 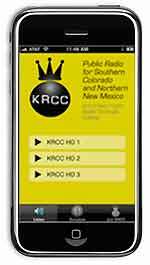 Sponsored by the Cultural Attractions Fund. Donna Mejia is a choreographer, lecturer, teacher, administrator, and performer specializing in an emerging genre of dance that combines Arab, African and nomadic traditions with American hip-hop and electronica. Her presentation will include performance and commentary on tribal fusion dance. 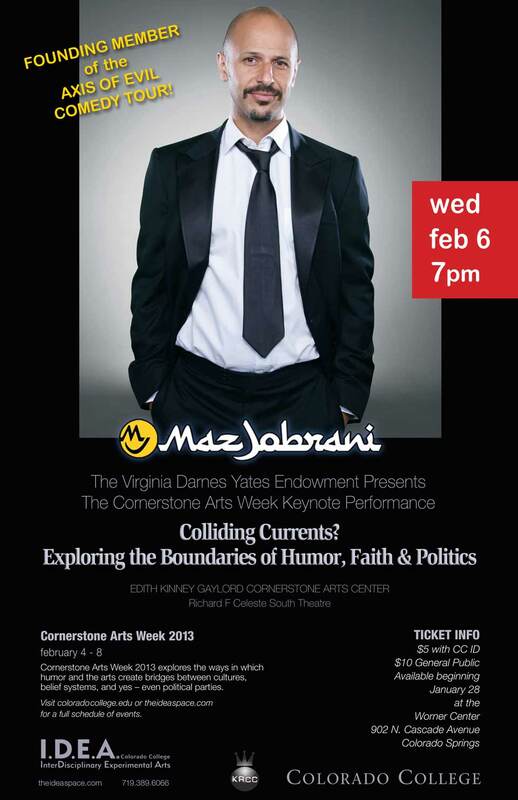 Sponsored by the Cultural Attractions Fund and the Theater and Dance Department. 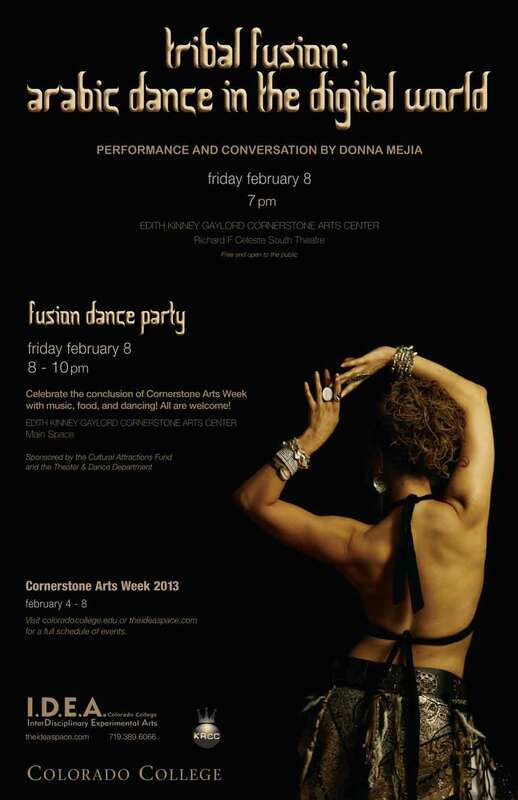 Celebrate the conclusion of Cornerstone Arts Week with music, food, and dancing!